Landscape gardener, McArthur, targeted victims linked to Toronto’s Gay Village over a period of seven years, with some arguing that police may have missed chances to catch the killer. “Especially when it comes to race and class and the LGBTQ community there has always been a distance in terms of how police work with the community”, said Haran Vijayanathan, of the Toronto-based Alliance for South Asian AIDS Prevention group. “We’re presuming that homophobia and racism had something to do with how much energy and effort went into investigating Project Houston”, he said, referring to an investigation into three missing men later found to be among McArthur’s victims. 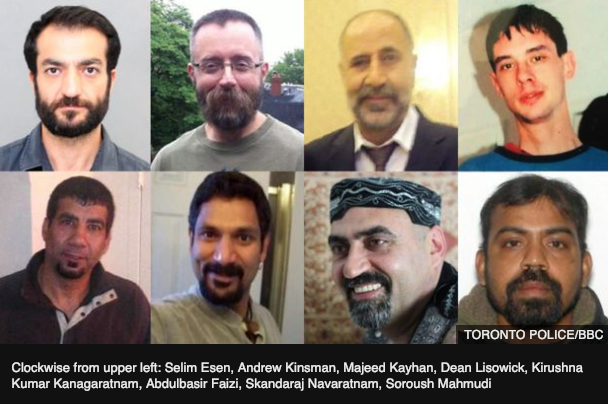 A spokesman for Toronto Police said investigators had “worked diligently” to “do everything possible to locate the missing men”. “We will continue to do what we can to support the community and look for opportunities to improve our relationship”, she added. McArthur admitted to killing eight men, who vanished over a seven-year period between 2010 and 2017. Some victims’ remains were found in the planters of homes where McArthur did landscape contracting. Justice John McMahon, in the Ontario Superior Court, said he had “no doubt Bruce McArthur would have continued killing” and noted McArthur had shown no signs of remorse at the sentencing hearing on Friday. It also emerged that officers had questioned the killer in 2016, after he was reported for trying to strangle a sexual partner, according to Canadian media reports. A number of investigations have been launched in the wake of the case, including a disciplinary case of an officer involved in an incident involving McArthur, and an internal review into how missing persons cases are handled. However, Helen Kennedy, the executive director of LGBT+ rights group, Égale, said an independent judge-led investigation should be carried out into the police’s handling of McArthur case specifically. “It’s important to sit down with the police and an outside investigator to have an inquiry so we can learn and make the necessary changes so this never happens again”, she told the Thomson Reuters Foundation. Jooyoung Lee, a sociologist and an expert on serial homicide cases, said the fact that McArthur’s victims belonged to marginalised groups may have helped him evade police for years. “Some of his victims were recent immigrants from other countries… and they were also part of an LGBT community that is not always a community that elicits prompt and thorough responses from police when somebody goes missing”, he said. He said criminologists used the term “missing white woman syndrome” to highlight how some victims are seen as more newsworthy and higher priority than others. “Hopefully, one thing that comes out of this is better lines of communication between the police and marginalised communities across the city”, he added.